Hair Replacement Options | Stylistic Inc. 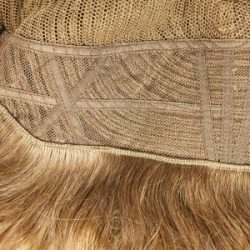 The base of your wig – typically referred to as the cap – is the material that the natural or synthetic hair is attached to, allowing it to slip over your head. There are different types of caps available, and while each manufacturer’s caps vary a bit, there are four basic types to choose from. Called both the classic and standard wig cap, this option is typically the least expensive, as it does not allow for as much flexibility as other hair replacement pieces do. Light and breathable, the classic cap has gaps between where hair is sewn in, providing the wearer with plenty of ventilation. Roots are teased to conceal the cap, adding plenty of fullness around the specific part location. When choosing a classic wig cap, you should be sure that you like the style and specific part location, as you cannot change where the part is located. Constructed with a natural appearance in mind, monofilament wigs are hand-tied at the top (or the entirety, depending on your preference) to make it look as though there is real hair growth coming from the scalp. With a monofilament wig, you can part your hair wherever you would like, changing up your style depending on your mood and the event. Created from sheer, lightweight material, the wig allows your skin to show through the cap for a very natural look. The base is typically capless for additional ventilation. For ladies who don’t like the look of bangs, a lace front wig is a beautiful option that makes the hairline by your forehead extraordinarily realistic. Created with a mesh insert at the front, the hair replacement piece is hand tied and typically worn with a special adhesive to keep the front in place. A special option for individuals who have thinning hair or are growing their hair back in after chemotherapy, an integration system allows you to pull your natural hair through the wig cap for a voluminous and realistic appearance. Depending on how much hair you have, there are different sizing options for the holes in the mesh cap. With this additional information, you can better decide what style hair replacement piece meets your particular needs. To try out your different options and find a customized fit you love, visit Stylistics’ Phoenix, Arizona shop. To schedule your appointment or a free consultation, call 602-234-3381.